Calvin Bedient is professor of English at the University of California, Los Angeles. His books include Eight Contemporary Poets (Oxford University Press, 1974), nominated for a National Book Award; In the Heart's Last Kingdom: Robert Penn Warren's Major Poetry (Harvard University Press, 1984); and He Do the Police in Different Voices: The Waste Land and Its Protagonist (University of Chicago Press, 1987). The recipient of a Guggenheim Fellowship and a frequent reviewer, Bedient is also the author of a book of poems, Candy Necklace (Wesleyan University Press, 1997), and an editor of the New California Poetry Series, published by the University of California Press. Eavan Boland is professor of English at Stanford University. The author of twelve books of poetry, including The Lost Land (Norton, 1998) and An Origin like Water: Collected Poems 1967-1987, she is also the author of Object Lessons: The Life of the Woman and the Poet in Our Time (Norton, 1995), a volume of prose, and coeditor (with Mark Strand) of The Making of a Poem: A Norton Anthology of Poetic Forms (Norton, 2000). Her awards include a Lannan Foundation Award in Poetry and n American Ireland Fund Literary Award. Alice Fulton is professor of English at the University of Michigan, Ann Arbor. She is the author of five books of poetry, most recently Felt (2001) and Sensual Math (1995), both published by Norton. A collection of her essays, Feeling as a Foreign Language: The Good Strangeness of Poetry, appeared from Graywolf Press in 1999. Among her many honors, she has received fellowships from the John D. and Catherine T. MacArthur Foundation and the Guggenheim Foundation. Linda Gregerson is professor of English at the University of Michigan, Ann Arbor. She is the author of two books of poetry, Fire in the Conservatory (Dragon Gate, 1982) and The Woman Who Died in Her Sleep (Houghton Mifflin, 1996). A third book of poems will appear from Houghton Mifflin in 2002. The recipient of many awards, including a Guggenheim Fellowship, she is also the author of two books of literary criticism, Spenser, Milton, and the English Protestant Epic (Cambridge University Press, 1995), and Negative Capability: Contemporary American Poetry (University of Michigan Press, 2001). Thom Gunn is retired senior lecturer of English at the University of California, Berkeley. Boss Cupid, published in 2000 by Farrar, Straus, and Giroux, is his twelfth volume of poetry. His Collected Poems appeared from the same publisher in 1994. He is also the author of several volumes of critical essays, most recently Shelf Life: Essays, Memoirs, and an Interview (University of Michigan Press, 1994), and has edited, among other works, The Selected Poems of Fulke Greville (University of Chicago Press, 1968). A recipient of many awards, including a MacArthur Fellowship, he lives in San Francisco. Robert Hass is professor of English at the University of California, Berkeley. His books of poetry include Sun under Wood: New Poems (Ecco Press, 1996), Human Wishes (Ecco Press, 1989), Praise (Ecco Press, 1979), and Field Guide (Yale University Press, 1973). He has also cotranslated several volumes of poetry with Czeslaw Milosz, most recently Facing the River (Ecco Press, 1995), and is the author or editor of several other collections of essays and translations, including The Essential Haiku: Versions of Basho, Buxon, and Issa (Ecco Press, 1994) and Twentieth Century Pleasures: Prose on Poetry (Ecco Press, 1984), which received the National Book Critics Circle Award. He served as poet laureate of the United States from 1995 to 1997. Anthony Hecht is a retired university professor in the Graduate School of Georgetown University. His seventh book of poems, The Darkness and the Light, was published by Knopf in 2001. He is the author of several books of critical essays, including Obbligati (Atheneum, 1986), and On the Laws of the Poetic Art (Princeton, 1995), based on the Andrew Mellon Lectures in the fine arts, and of a critical study of the poetry of W.H. Auden, The Hidden Law (Harvard University Press, 1993). A collection of essays on poetry and religion, Melodies Unheard, is forthcoming from Johns Hopkins University Press. Among his many honors, Hecht received the Robert Frost Medal for 2000 from the Poetry Society of America. William Logan is alumni/ae professor of English at the University of Florida. He is the author of five volumes of poetry, most recently Vain Empires (Penguin, 1998) and Night Battle (Penguin,1998). He has also published two books of essays and reviews, All the Rage (University of Michigan Press, 1998), and Reputations of the Tongue (University Press of Florida, 1999), the latter a finalist for the National Book Critics Circle Award in Criticism. Among his honors are the Peter I.B. Lavan Younger Poets Award from the Academy of American Poets and the Citation for Excellence in Reviewing from the National Book Critics Circle. Heather McHugh is Milliman Distinguished Writer-in-Residence each spring at the University of Washington in Seattle. At other times she works with poets at the low-residency MFA Program for Writers at Warren Wilson College. Her most recent books, published by Wesleyan University Press, include GLOTTAL STOP: 101 Poems by Paul Celan, a translation with her husband Nikolai Popov (University Press of New England, 2000); The Father of the Predicaments, a volume of poems (Wesleyan University Press, 1999), and a collection of critical essays, Broken English: Poetry and Partiality (Wesleyan University Press, 1993). Hinge & Sign: Poems 1968-1993 (Wesleyan University Press, 1994) was a finalist for the National Book Award. In 1999 she was elected a chancellor of the Academy of American Poets. Carl Phillips is professor of English at Washington University, St. Louis. He is the author of five books of poems, most recently The Tether, published by Farrar, Straus, and Giroux in 2001, and Pastoral, published by Graywolf Press in 2000. From the Devotions (Graywolf Press, 1998) was a finalist for the National Book Award.. He is the recipient of a number of awards and fellowships, including ones from the Guggenheim Foundation, the Library of Congress, and the Academy of American Poets. Jonathan F.S. Post is professor of English at the University of California, Los Angeles, and former chair of the Department. He is the author of Henry Vaughan: The Unfolding Vision (Princeton University Press, 1982) and Sir Thomas Browne (G.K. Hall, 1987). Most recently, he has published George Herbert in the Nineties: Reflections and Reassessments (1995, with Sid Gottlieb), and English Lyric Poetry: The Early Seventeenth Century (Routledge, 1999). He has been a Fellow of the National Endowment for the Humanities and the Guggenheim Foundation. Peter Sacks is professor of English at Harvard University. He is the author of five collections of poems, most recently Natal Command (University of Chicago Press, 1997), O Wheel (University of Georgia Press, 2000), and Necessity (forthcoming from Norton, 2002). An author of essays and reviews on poetry and on art, he received the Christian Gauss Award for The English Elegy: Studies in the Genre from Spenser to Yeats (Johns Hopkins University Press, 1986). Stephen Yenser is professor of English at the University of California, Los Angeles. His book of poems, The Fire in All Things (Louisiana State University Press, 1993) won the Walt Whitman Award from the Academy of American Poets. He is the author of three books of criticism, A Boundless Field: American Poetry at the Century's Turning (University of Michigan Press, 2001), The Consuming Myth: The Work of James Merrill (Harvard University Press, 1987), and The Poetry of Robert Lowell (University of California Press, 1975 ). He is also co-editor (with J.D. McClatchy) of the Collected Poems of James Merrill (Knopf, 2001). Green Thoughts, Green Shades is a strikingly original book, the first and only of its kind. 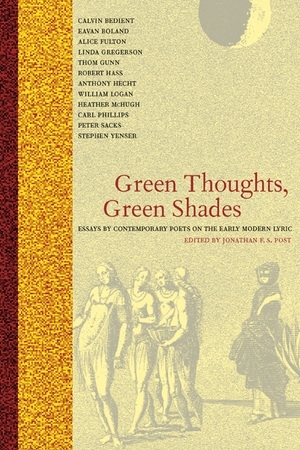 Edited and introduced by noted seventeenth-century scholar Jonathan Post, it enlists the analytic and verbal power of some of today's most celebrated poets to illuminate from the inside out a number of the greatest lyric poets writing in English during the sixteenth and seventeenth century. Written by people who spend much of their time thinking in verse and about verse, these original essays herald the return of the early modern lyric as crucial to understanding the present moment of poetry in the United States. This work provides fascinating insights into what today's poets find of special interest in their forebears. In addition, these discussions shed light on the contributors' own poetry and offer compelling clues to how the poetry of the past continues to inform that of the present. Jonathan F. S. Post is Professor of English at the University of California, Los Angeles. He is the author of English Lyric Poetry: The Early Seventeenth Century (1999), Sir Thomas Browne (1987), and Henry Vaughan: The Unfolding Vision (1982). 12. Edward Taylor: What Was He Up To?